A rather disturbing document surfaced on the Internet Saturday with grave implications concerning how the Obama administration is recruiting interns from public schools to assist in advancing the President's agenda along with his desire to get Democrats including himself elected. Even scarier, the internship application recommends participants read Saul Alinsky's "Rules for Radicals." An Atlas reader, Chuck, has a student in the eleventh grade in an Ohio High School. 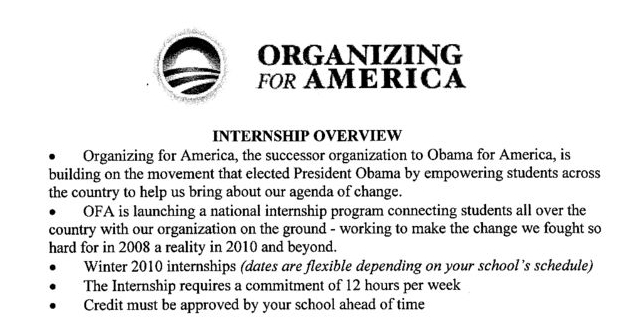 Her government class passed out this propaganda recruiting paper so students could sign up as interns for Obama's Organizing for America. Nice. Let's get America's youth to read Alinsky's "Rules for Radicals!" Earn credit for school and help change the world! From his earliest years as an elected official, President Obama has encouraged young Americans to believe that their efforts can change their world for the better. If you are passionate about reviving the economy, making the United States a global leader in clean energy, and want to be on the frontlines of political change, apply for an OFA internship today. No prior experience is necessary. 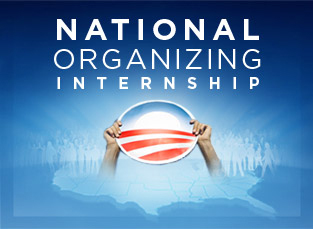 Spring Semester Internships are currently available with Organizing for America - Nevada. Apply for a Spring 2010 internship before the January 31st deadline by filling out this application. Learn how grassroots organizing can win an election, impact policy, or change a neighborhood. Take an active role in advancing key legislation including reform in health insurance, energy, education and more. Organizing for America-Nevada is currently accepting applicants for our Spring Internship. Interns will work jointly with our Regional Field Directors to build a strong grassroots network across Nevada, and help us to pass President Obama's legislative agenda. Activities will include recruiting and managing volunteers, organizing service and press events, voter contact activities, voter registration, and administrative support work. You need not be a student to apply. Credit is available at most schools, but it is the sole responsibility of the student to make the arrangements. Applications will be accepted through January 31st, 2010 for Spring term. The internship will last until the end of Spring term, and Interns commit to at least 12 hours per week. Organizing for America (OFA) has two priorities: (1) organize support for President Obama’s policy agenda, and (2) build and strengthen the grassroots organization we built during the 2008 campaign by training and empowering people to have an impact in their own communities. The most important thing OFA does is build support for and educate citizens about President Obama’s policies for change. Our national internship program will connect students all over the country with our organization already on the ground — working to make the change we fought so hard for a reality. The internship will last from January 11-May 7, but the start and end dates are obviously flexible based on a school’s schedule. The internship requires a minimum of 12 hours per week, and would be based out of our Seattle office. Clearly this is a real program recruiting students from coast to coast. Readers are highly encouraged to review all the pages of this application at Atlas Shrugs. Exit question: Is this something that should be happening at public schools funded with tax dollars, and isn't this a question media members should be asking?